It is with great sadness that we announce the passing of Anne. 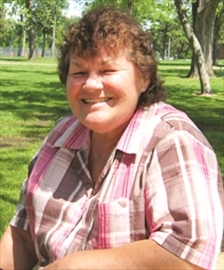 Anne passed away peacefully at her Lindsay home, in her 66th year. Beloved daughter of Les and Bella, dear stepdaughter to Kathryn. Loving mother to John. Dear sister to Jim (Carmen), Joy (Gary), Rick (Tina), Randy (Angela) and Gerry. Anne will be dearly missed by all including many wonderful Aunts and Uncles, Cousins, Nieces and Nephews, their children, caring friends and fond neighbours. Please join us for a Celebration of Life honouring Anne on April 16, 2016 at 1:00 pm at Riverwood Mobile Home Club House, Lindsay Ontario. A service and luncheon will be provided. A private interment will take place at a later date. If desired, the family requests that any donations be made to the Canadian Cancer Society. Anne believed that every morning is a cheerful invitation to enjoy the beauties of nature.